Isn't that the truth? Why do we waste so much time trying to the best of everybody else? Our time would be so much better spent trying to be the best of ourselves. 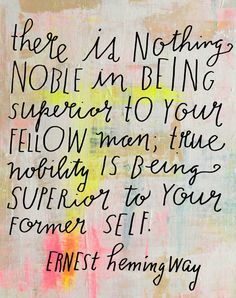 Let's face it - there will always be someone better, so if your goal is to be better than everyone else, you will never reach it. The point of setting goals is to eventually achieve them. So why not stop focusing on what everyone else is doing and start focusing on what you're doing instead? P.S. Keep checking back this week. I've got some really exciting news I hope to be able to deliver soon!